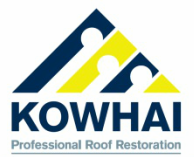 This tool is to help you view how your house could look, coated with a new Kowhai Roof Colour. We hope you like experimenting with your new roof colours. A step by step guide is shown below. This tool is a guide only - the colours are at best, indicative. Ask your Kowhai Guy for a colour chart, or use the colour chart contained on this website. ​Upload a photo of your home.